What Happened: National City’s council members unanimously approved a funding appropriation for and language changes to an agreement bringing a waterfront center adjacent to Pier 32 Marina. City officials requested additional funding from the Port of San Diego to complete National City’s Waterfront Adventure Center this month. The port’s board of commissioners approved the funding request but placed a condition on the agency’s agreement with National City as to when the funds would be available. National City’s City Council had to approve the port’s action for it to be official. Council members adopted the port’s action at its Nov. 3 meeting. 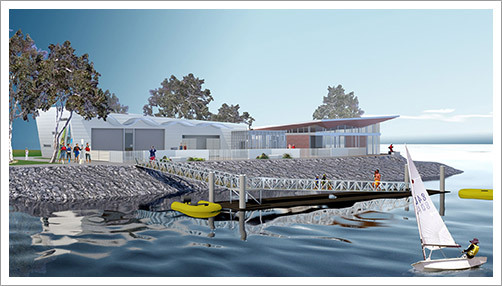 What’s On Tap: National City will receive an infusion of $223,110 from the Port of San Diego to fund the completion of the Waterfront Adventure Center, which will include amenities for boaters. The funding will be available after the city has paid its vendors, a certification of occupancy is issued, inspection approvals are issued in accordance with the Americans with Disabilities Act and the county records completion documents. What Happened: The Los Angeles County Board of Supervisors approved a series of fee waivers to promote public participation in the 53rd annual Holiday Boat Parade at Marina del Rey. “In order to encourage public participation of this exciting event, complimentary boat launching and free parking at all county lots operated in the marina should be provided to the general public,” county staff stated in a report to supervisors. What’s On Tap: Fees for public parking and the visitor boat dock will be waived between 3 p.m. and midnight on Dec. 12. More than $20,000 in fees will be waived. What Happened: Supervisors also approved the receipt of a state grant to help pay for abandoned boats in Marina del Rey. Los Angeles County Sheriff’s Department requested $53,300 to cover services and supplies for the removal of abandoned or surrendered vessels. This grant will assist the department in eliminating the Marina del Rey Harbor and Santa Monica Bay waters of abandoned and submerged vessels. The department will also be able to assist registered owners of recreational vessels who are no longer able to pay their slip fees due to economic hardships and have expressed an interest in surrendering their vessel through the [Surrendered and Abandoned Vessel Exchange] Program,” city staff stated. What’s On Tap: Los Angeles County must match the state’s grant with a $5,330 contribution, making the total budget for servicing abandoned or surrendered boats $58,630. County officials will have access to the funds now through Sept. 30, 2017. What Happened: The court process surrounding Brian Cleveland Dunn’s criminal accusations is entering its 13th month. Dunn, a county contractor accused of misappropriating funds while operating a business at Dana Point Harbor, continues to have his calendar filled with court appearances. He was scheduled for a pre -trial hearing on Oct. 29. Another court appearance is set for Dec. 3, according to court records. Dunn’s criminal case was on the Oct. 15 docket for a “Pre-Trial Warrant Hold” hearing; he was originally scheduled for a jury trial on Sept. 22. Court records indicate the trial was pushed to Oct. 27; according to court records, Dunn also appeared at the Santa Ana courthouse on Oct. 6 and 15. What’s On Tap: Dunn’s Dec. 3 hearing is set for 8:30 a.m. in Department C49 of the Orange County Superior Court in Santa Ana.